Relevance TAT-C3 consists of the Clostridium botulinum C3 exozyme (C3 ADP-ribosyltransferase) linked to an HIV TAT leader sequence that permits transduction of the protein across the plasma membrane. The cell penetrating moiety allows rapid and efficient transport through the plasma membrane. Once in the cytosol, the cell penetrating moiety is released, allowing C3 Transferase to freely diffuse intracellularly and inactive RhoA, RhoB, and RhoC, but not related GTPases such as Cdc42 or Rac1. TAT-C3 can be used to inactive Rho proteins in fibroblasts, neurons, epithelial, endothelial, and hematopoietic cells as well as other primary and immortalized cell lines. Notes Purification protocol detailed in Sahai et al. 2006. Methods Enzymol. 406:128-40. PMID: 16472655. Rodrigues et al. 2014. Nat Commun. 5:5458. PMID: 25413277. RHOA inactivation enhances Wnt signalling and promotes colorectal cancer. Croft et al. 2011. Cell Res. 21(4):666-82. PMID: 21079653.
p53-mediated transcriptional regulation and activation of the actin cytoskeleton regulatory RhoC to LIMK2 signaling pathway promotes cell survival. Hanley et al. 2010. Proc Natl Acad Sci U S A. 107(27):12145-50. PMID: 20566876. 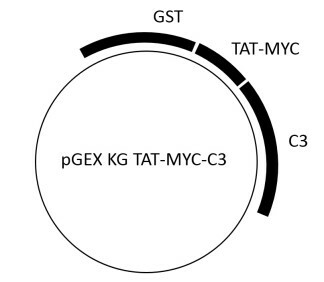 Motorized RhoGAP myosin IXb (Myo9b) controls cell shape and motility. Kumar et al. 2009. Mol Cell Biol. 29(15):4262-73. PMID: 19470758. The transcriptional activity of Sox9 in chondrocytes is regulated by RhoA signaling and actin polymerization. Busche et al. 2008. J Cell Sci. 121(Pt 7):1025-35. PMID: 18334560. Sahai et al. 2006. Methods Enzymol. 406:128-40. PMID: 16472655. Pollock et al. 2005. Cancer Res. 65(4):1244-50. PMID: 15735008. Oncogenic K-RAS is required to maintain changes in cytoskeletal organization, adhesion, and motility in colon cancer cells.